It is the policy of Total Technical Services to ensure as so far as is reasonably practicable the Health, Safety and Welfare of all employees working for the company or other persons who may be affected by our undertakings. Total Technical Services recognises its obligation to meet all relevant legislative requirements pertaining to Health and Safety which apply to any of the undertakings of the organisation. We are currently accredited with ISO 9001 and ISO14001, and these policies are maintained at all levels within the company. We are also very aware of current thinking regarding environmental issues and continually monitor the changes taking place. All of our Engineers are trade qualified and have successfully completed an approved refrigerant handling course and are registered in the ACRIB Refrigerant Handling Register. We as a company have recently obtained FGAS certification. Total Technical Services acknowledge that the key to successful Health and Safety management requires an effective policy and organisation. Disclaimer: All manufacturer logos, product images and brand names used on this website are the copyright of their repsective owners. The TTS logo, all custom images, text, scripts and the code used to make up this website are the copyright of Total Technical Services Ltd. Some images are used for illustration purposes only and might not be identical to available models. 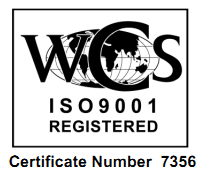 No part of this website may be reproduced without the express written consent of Total Technical Services Ltd.
We are ISO9001 certified by WCS. World Certification Services is an ANAB & UKAS Accredited Certification Body providing assessment and certification services against many internationally recognised standards.